What are your favourite movie characters doing now? Do you wanna build a snowman? 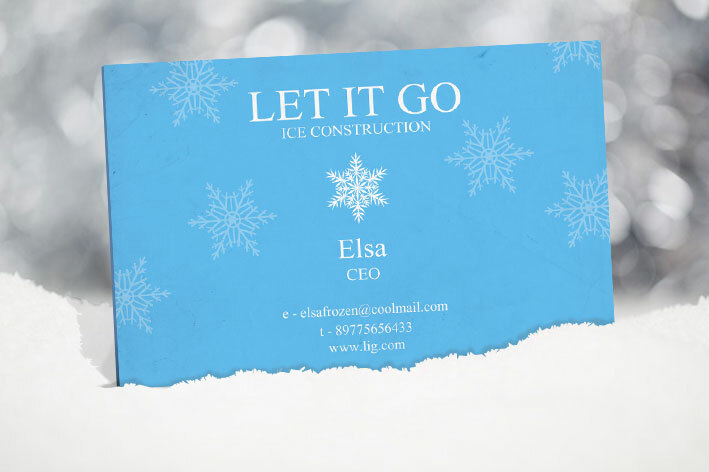 Well, actually Elsa has put her icy powers to practical use and can build you pretty much anything! Just give her a call from this handy business card (we cannot be held liable if you find yourself with a frozen heart, however). 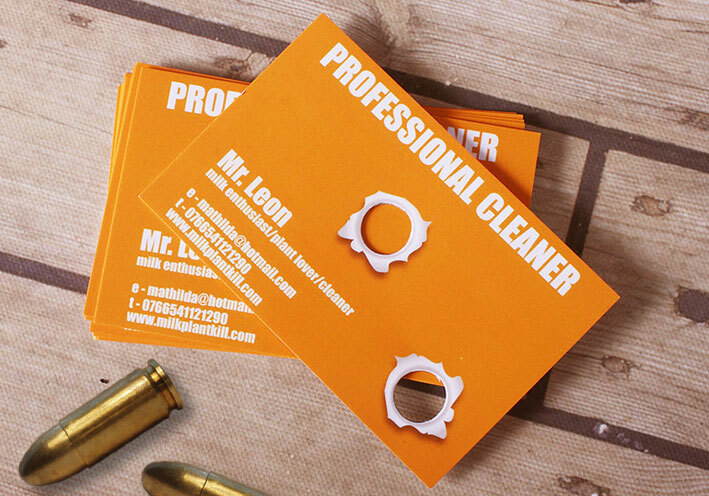 Fun, lovable and more than a little bit cheeky, and that’s just his business card! Charlie Chaplin’s ‘The Tramp’ character warmed the hearts of many in the early twentieth century with his mischievous grin and disastrous adventures. 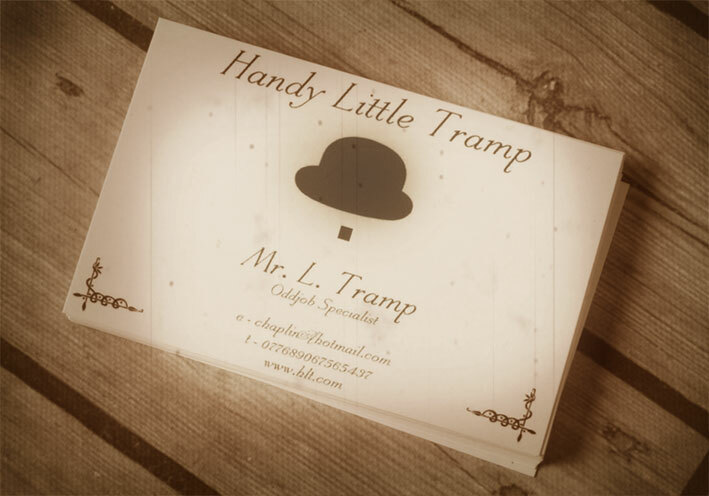 You may not trust the little tramp to do your odd jobs, but with a business card like this you’d have a hard time saying no – even if his trousers are a bit too big for him! 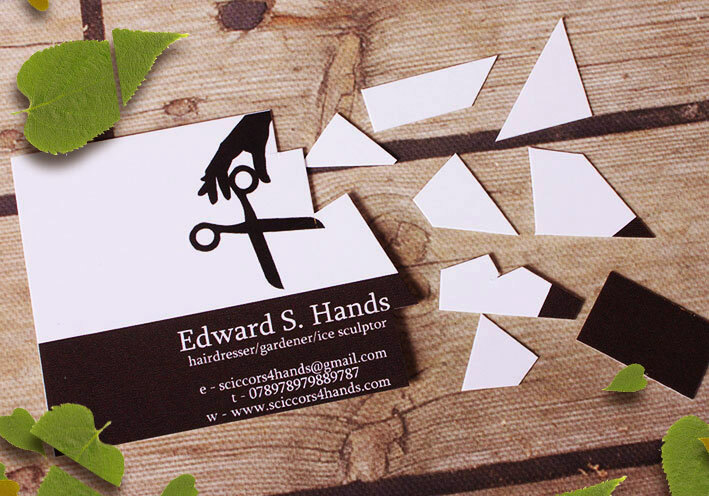 A little sprinkle of fairydust helped to create this teeny tiny business card! 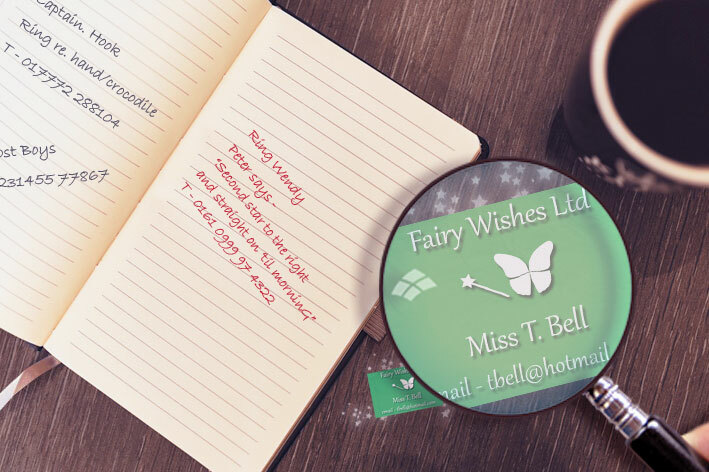 Hire Miss T.Bell and all of your wishes will come true… (Maybe). Worry not; Obi Wan Kenobi is here to take care of all of your jedi master needs. Are you having a pesky droid invasion? That’s one of his specialities! Or you could just take his business card and call him if anything comes up. 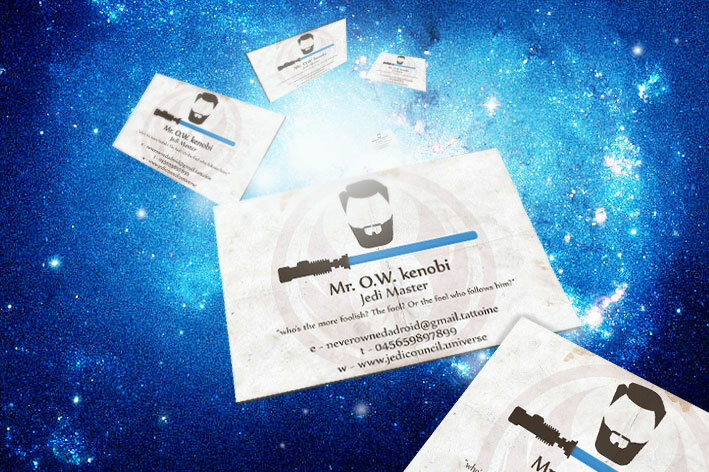 This is the business card you’re looking for! 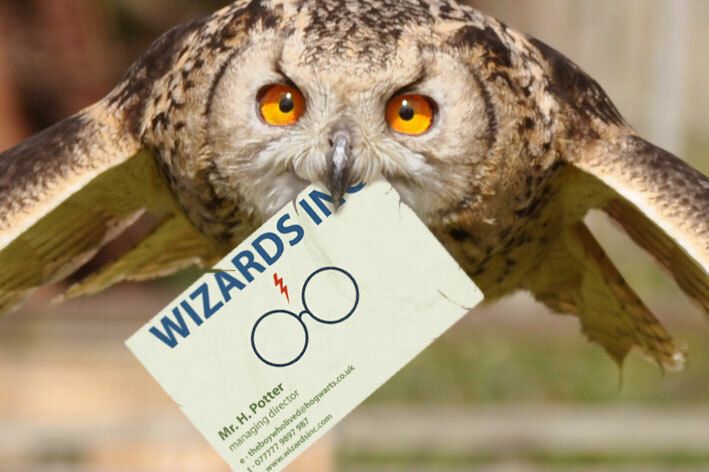 Mr H. Potter may solemnly swear to you that he is up to no good, but it has not stopped him from becoming the Managing Director of Wizards Inc! What they do we are not 100% sure, but we bet his office is a bit nicer than the cupboard under the stairs! 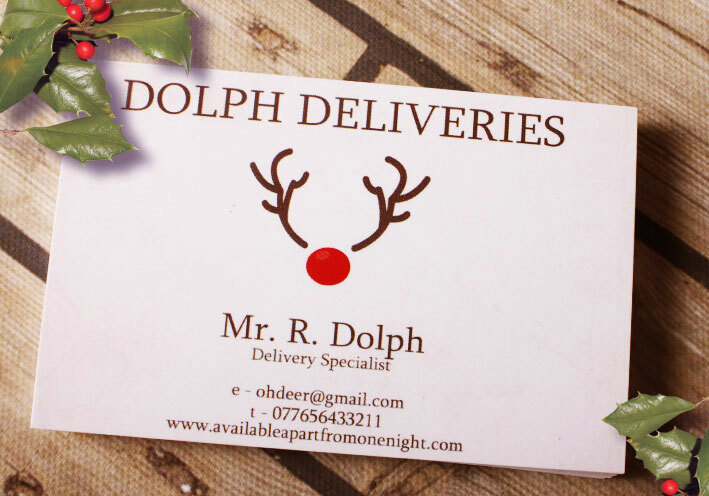 Why use a boring delivery van when you can get your parcels delivered from Rudolph the Red Nosed Reindeer! No-one will be laughing or calling you names with this quick and speedy delivery service coming to town! Take car. Go to Mum’s. Kill Phil. Grab Liz. Go to the Winchester. Have a nice cold pint and wait for all of this to blow over. 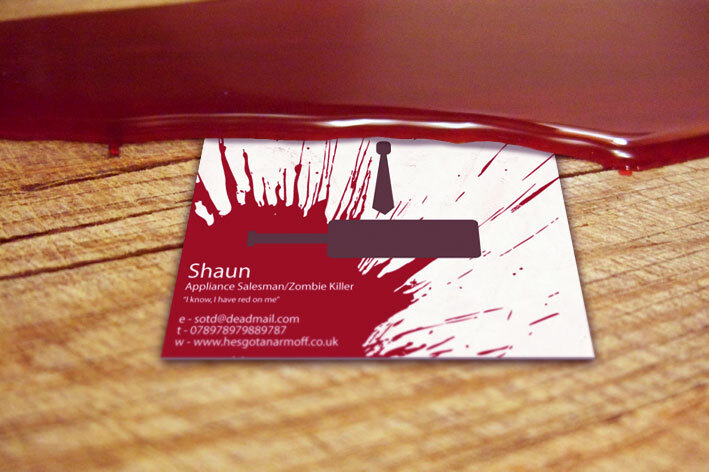 Or you could just take Shaun’s business card and give him a call if you need any assistance with the upcoming zombie apocalypse. Do you have a sensitive issue with your neighbour that requires the services of a professional ‘cleaner’? Or are your plants just in need of some love and attention? Well…just give Mr. Leon (second name mysteriously unknown) a call and he will cater to your needs – he promises to be discrete, just make sure you have plenty of milk in the fridge. On the 9th April 2012, the then 13 person startup Instagram was sold to Facebook for a whopping 1 billion dollars (well, $300 million in cash, the rest in Facebook shares!). Since then the world’s most popular photo sharing app has gone from strength to strength, with over 100 million people actively using Instagram in the present day. New to Instagram? Head over to our Ultimate Guide to Using Instagram as a Business: Beginner’s Edition for some tips for new Insta users! 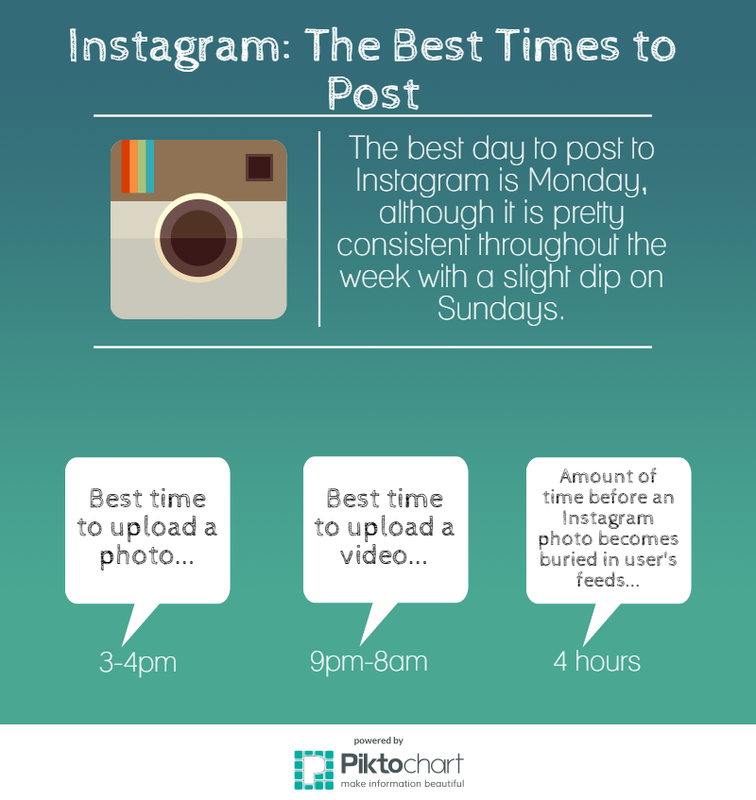 Although Instagram is a fantastic app to use just on its own, there are a variety of different apps that you can use to help you to get the most out of your Instagram experience. Whether you want to edit your photos in a different way, or simply want to jazz up your Insta Feed, there is an app (or several) that can help! If you are looking for a relatively simple extension for your Instagram app then Instapad is a brilliant place to start. Not only does it provide you with larger versions of your images but it also gives you the rather unique option to send your photos to other people in the form of a postcard. ; a great way to keep in contact with your customers and provide that personal touch that so many brands lack these days. In the world of Instagram, there are few things more annoying than a brand that posts more than a couple of photos at once, especially if they are of similar things such as product colour variations. This is where Pic Joiner really comes into its own! It is very simple to use and gives you a range of different pic-joining options, so you can even pull off joining an odd number of photographs without having the dreaded gap! A must have for those who just can’t get enough of posting new products on Instagram. 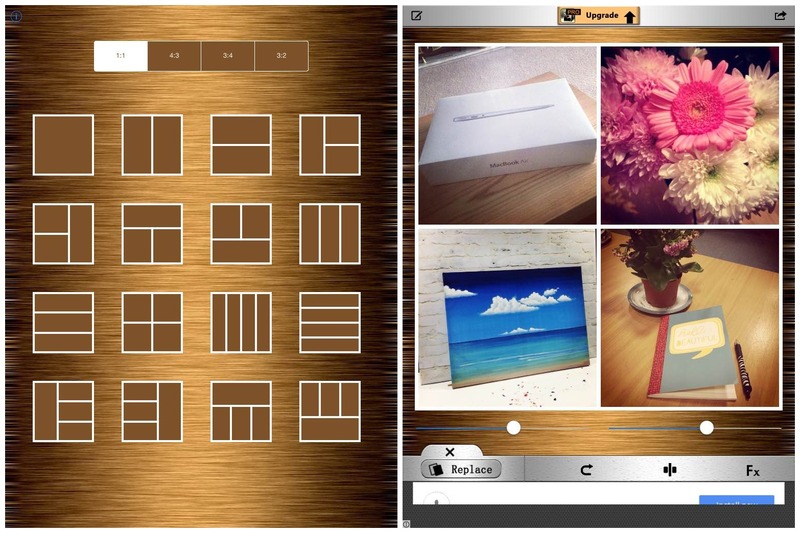 If you are looking for a slightly more organised way of browsing Instagram then Padgram is just the app for you! This app gives you the option to browse photographs by different categories as well as allowing you to keep up with photographs that you have ‘liked’. 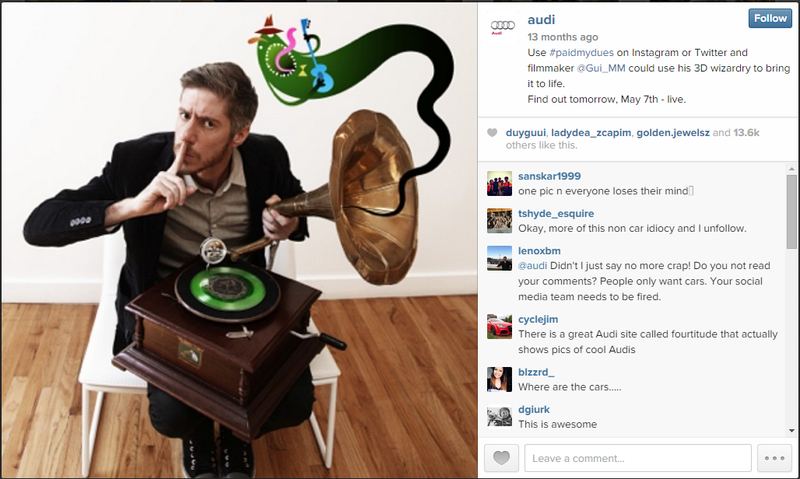 Padgram is especially useful for brands looking for some Insta inspiration! Afterlight is a fantastic little photo editing app that allows you to give your photos a little bit more of an edge than the basic Instagram filters. It’s a great app if you are quite new to editing photographs and allows you to have a play around with things like the saturation, exposure and contrast of your photograph, to name a few! This handy photo editing app focuses mainly on light manipulation so you can make you images look even more professional. You can also add multiple effects to your photograph along with various light filters, meaning that you can really tweak your image until it is just right! Delete them: The only thing worse that ignoring the negative comment is to delete it. Yes, doing this might provide a quick and pain-free relief from the negativity impacting your Instagram page. However, you are running two pretty serious risks: 1) the author of the negative post could see that you have deleted it which will probably only serve to make them more determined to spread the word about their negative experience with your brand and 2) other Instagram users could have already seen the post, which would allow them to draw their own conclusions about the kind of company that treats its customers with an ‘out of sight, out of mind’ mentality. A popular cosmetics company had an issue with its website security. However, instead of responding to the Instagram complaints that followed, they simply proceeded to blame other companies and then delete the comments. Customers soon took to discussion boards to complain. This was one of the responses on popular website Reddit. Retaliate in the same fashion: Never under any circumstances, even if the customer’s comment is uncalled for and inaccurate, retaliate in an angry manner. Posting a response that lets them have it with both barrels will simply make you look unprofessional and downright unhinged, as well as serving to alienate existing and potential customers. Just don’t do it. So… that’s the bad stuff out of the way, but what should you actually do if you come across a negative Instagram comment (Or a bunch of them)? Well, the answer to this actually depends entirely on the nature of the comment. If the customer is angry due to being offended by the photograph that you have posted for whatever reason, my advice to you would be to remove it as soon as possible. If it offends one person, chances are it will/already has offended many more. If the customer is complaining about a product or service that you have (or perhaps haven’t) provided to them, then you need to respond promptly with an apology and a solution that will benefit the customer in this particular situation. Don’t just respond with a message that sounds automated. For example, if the customer posts a comment that details their annoyance with your main website being slow, a discount code probably won’t really help them! 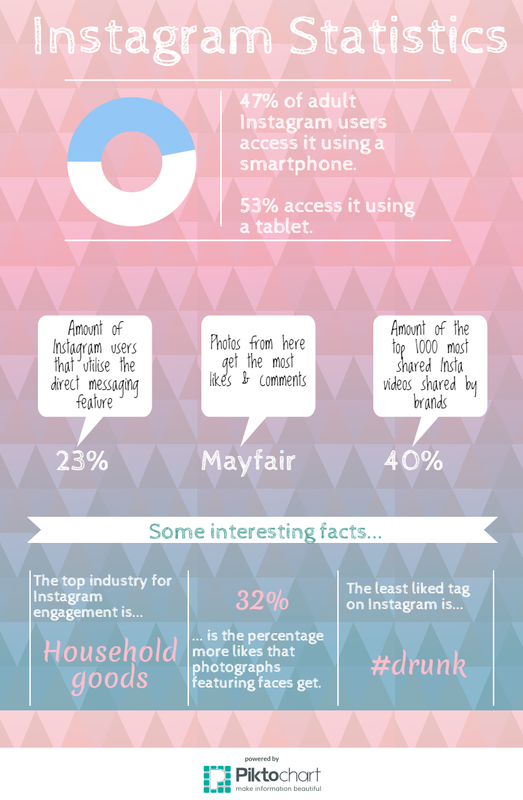 Do you have any more tips for using Instagram as a business? Spread the word in the comments section!